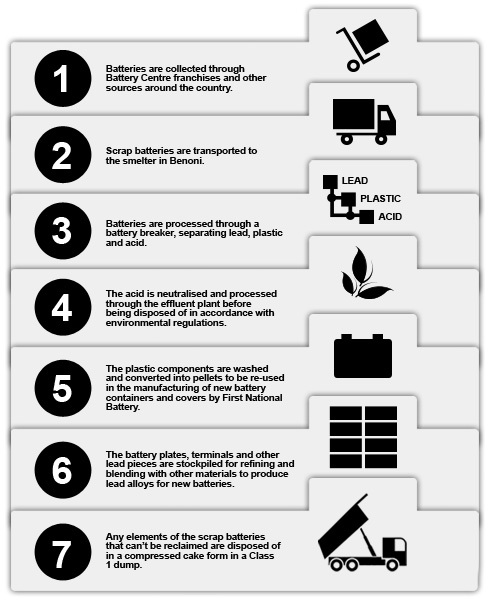 First National Battery’s recycling division, Scrap Battery, is responsible for the collection of used lead acid batteries across South Africa. Battery Centre franchises act as drop off points for old batteries, while Scrap Battery also offers a collection service for large volumes of batteries. Scrap batteries are recycled at First National Battery’s recycling plant in Benoni and are processed to the point that the majority of the components can be used to manufacture new automotive batteries.